Manitoba, like North Dakota and South Dakota, was rich with water during the 1990s and helped pump North America’s waterfowl populations to record levels. But drought conditions finally have come to the Canadian prairies, prompting biologists to worry. Bob Brudy, a conservation officer with Manitoba Conservation, the province’s equivalent of Minnesota’s Department of Natural Resources, said drought this year has hit central Manitoba’s prairies hard. The loss of water is evident. Ponds brimming with water last year are mud puddles this year. But many of the larger lakes and sloughs still have water and continue to provide nesting and refuge for ducks. 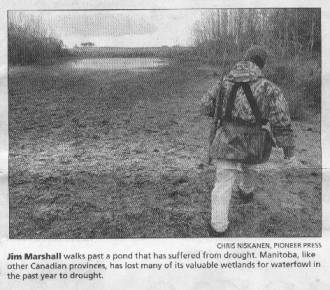 Last week, Marshall huddled along a marsh’s edge and watched ducks careen from the sky. 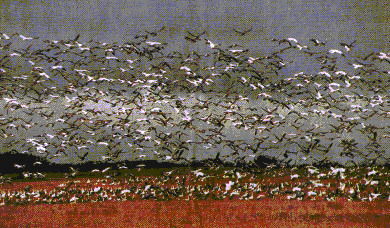 It was freezing farther north; snowstorms swept down from the sub-arctic, putting hundreds of thousands of waterfowl into the sky. He watched and knew something was happening. As Canadian lakes and swamps become locked in ice, hordes of birds were moving out of Canada and into the United States. Freeze-up isn’t far away. Marshall, and all waterfowlers, know what those signs mean. Ducks, snow geese and Canada geese — from The Pas, Manitoba, to Pierre, S.D., to Minnesota’s Swan Lake — are on the move.